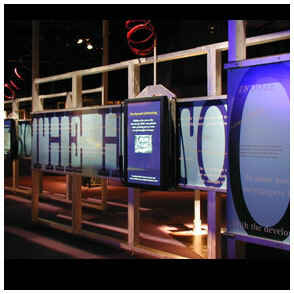 The Reading Wall uses a moveable plasma display to dynamically explore episodes in the history of reading. XFR: Experiments in the Future of Reading is an award-winning, 4,000 square foot interactive installation featuring twelve experimental reading systems. Created in 2000, it was the result of an 18-month research and design project by a team of eight interdisciplinary researchers, including Matt Gorbet. XFR is the result of a partnership between the Xerox Palo Alto Research Center (PARC) and The Tech Museum of Innovation to explore and demonstrate how PARC's cutting-edge technologies could create new, engaging and dynamic forms of reading. The exhibition challenged the standard conventions of museum design, resulting in measurably engaging exhibits with unusually high stickiness. The original XFR exhibit ran for six months, from March until September 2000 and saw over 500,000 visitors, and subsequently toured Asia and North America through the Association of Science and Technology Centers. Two of the XFR projects were recognized with Gold and Silver awards in ID Magazine's 2001 Interactive Media Design Review. Xerox, Xerox PARC, PARC, and XFR are trademarks of their respective owners.